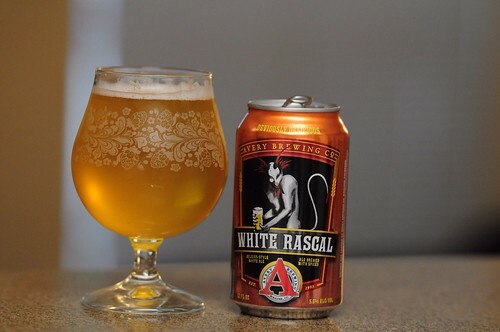 Avery White Rascal, originally uploaded by adambarhan. Appearance: Pours a cloudy, light gold body with a small white head. Smell: Aroma of honey and tangy-scented wheat malt with a full spiciness and notes of orange peels. Taste: Tangy, lightly sweet wheat malt followed by a dose of coriander and orange peel. Touch of honey. Distinct pear fruitiness Spicy hops with a light bitterness. Pinch of coarse black pepper near the end. Orangey, spicy finish with a faint lingering sweetness. Drinkability: Tasty,a refreshing summer beer for sure.